I'm providing support for my extendable mpv.net player here. Visit the website on github. I'm looking forward discussing anything mpv and mpv.net related in this thread. Last edited by stax76; 20th Apr 2019 at 13:29.
could you add something like mpv-install.bat to make it the default video player? the above one is from mpv.io but i prefer your build. I've interest in this topic but didn't investigate it in depth yet. Which OS are you running? There are differences between W 7 and W 10, ten has restrictions. What can be used to make an app default in 10 is the 'Open With' feature of the File Explorer. Last edited by stax76; 30th Mar 2019 at 12:55.
it's win10, the one from mpv.io works, even in win10. just did a bulk replace from "mpv.exe" to "mpvnet.exe", it works without problem, maybe you can add it to the zip next time. Last edited by nanana; 30th Mar 2019 at 13:58. I don't have experience with batch files and spent some time thinking which tool I can use and decided then to use an installer (Inno Setup) in combination with a small .NET command line app that runs hidden by the installer changing the registry (uninstall is implemented). wow. love the update, make things easier. Hello. Please tell me how to start playing a particular *.mp4 file after compilation in Visual Studio? Where and how do I set this option so that the player starts playing my file right away ? Visual Studio allows you to pass a command line when you start debugging. Just enter your source file path there and don't forget to enclose it in quotes if the path contains blanks.
' --autofit=50%' on the command line, WxH isn't implemented and only percent values are accepted. Last edited by stax76; 6th Apr 2019 at 20:18. First release of my Wox launcher plugin to control mpv. is now only shown if the settings were actually modified. tracks with various metadata. Menu default definition. The screenshots were updated showing the new track menu. mpv.net command that shows detailed track info and has no 'no audio' track. Default binding. the Tracks menu supports now MKV edition selection. Default binding. the Navigate menu supports now chapter selection. Default binding. 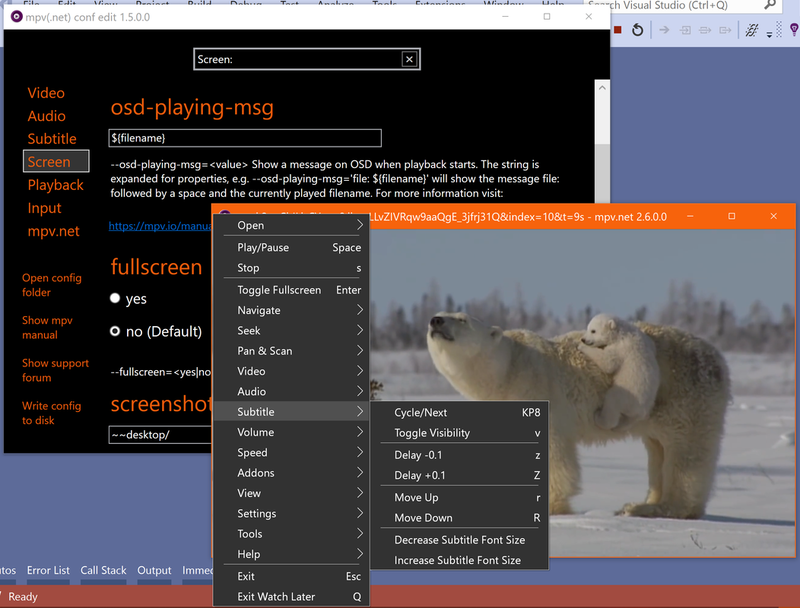 Correct way to install mpv (media player) in Windows?